Google has come out multiple times to state that Google does not penalize a site for having multiple 404s on a website. But the myth that there is some sort of penalty associated with having many 404 pages on a site still persists. And Gary Illyes from Google took to Twitter to address the rumors. Whoever came up with the idea that having 404s gives a site any sort of penalty, you're wrong. Utterly wrong. If the number of 404s could lead to a penalty in Google, it would be a pretty easy tactic for anyone to use for negative SEO purposes. If the 404 penalty actually existed, you could just start throwing nonsensical links at a competitor’s site, make sure they got indexed, then profit. There can also be all kinds of other reasons for a site having mny 404s, whether a CMS failure, a server misconfiguration or even an incorrectly implemented HTTPS or site redesign could cause plenty of 404 errors on a site. 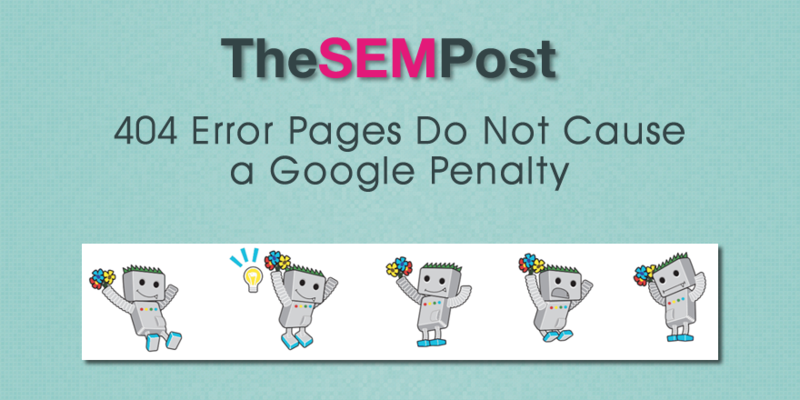 It wouldn’t be in Google’s best interests to allow a 404 penalty, either for the negative SEO potential or simple webmaster error. Illyes was also asked for clarification on whether there is a negative impact on a site that changes a page to a 404 and then back to a 200 would have any problems, such as in a case with a product returning to stock. @WLau89 Nope, no negative effect. This is something Google has addressed previously, including in a blog post on the Google Webmaster Blog back in 2011. A: If some URLs on your site 404, this fact alone does not hurt you or count against you in Google’s search results. John Mueller also addressed this back in 2013, also referencing the blog post. 1) 404 errors on invalid URLs do not harm your site’s indexing or ranking in any way. It doesn’t matter if there are 100 or 10 million, they won’t harm your site’s ranking. However from an SEO perspective, it would be smarter to serve a regular webpage with an out of stock notation rather than change it to a 404 when it is out of stock, for ranking purposes. Some argue there is a connection, namely because as 404s increase, traffic from Google drops… but much of this can be attributed to the fact Google will stop sending traffic to any page that starts returning not found errors, because it obviously isn’t a good user experience for Google to send someone to a webpage that doesn’t happen to be there anymore. But 404s can also alert users to issues that can cause inadvertant ranking issues, such as pages being served incorrectly through a CMS or server configuration issue, or through a poor implementation of redirects or HTTPS change. So while 404s don’t hurt a site per se, they can alert a site owner to issues that have the 404s as an end result. Bottom line, 404 errors will not hurt your rankings but don’t always ignore them as they can highlight any problems with the site. Very contradicting. It seems a 404 doesn’t have an effect on technical SEO, however, it could cause poor user experience and a quick bounce. Thus user experience does play a big role in SEO today.